It’s that time of year again where agents start making noise. The motives are not always clear, but public comments are always a sign that there’s going to be an issue between a player and the club on the horizon. It’s a clever ploy in some respects. The only thing he mentions is that there are a number of interested clubs, but that can be interpreted in a number of ways. It could be a sign that the Danish international is seeking to leave, but if the recent photos of him and Poch together in Denmark are anything to go by, it hardly suggests our no.23 is angling for a move away. Far more likely is this is a negotiating tactic. 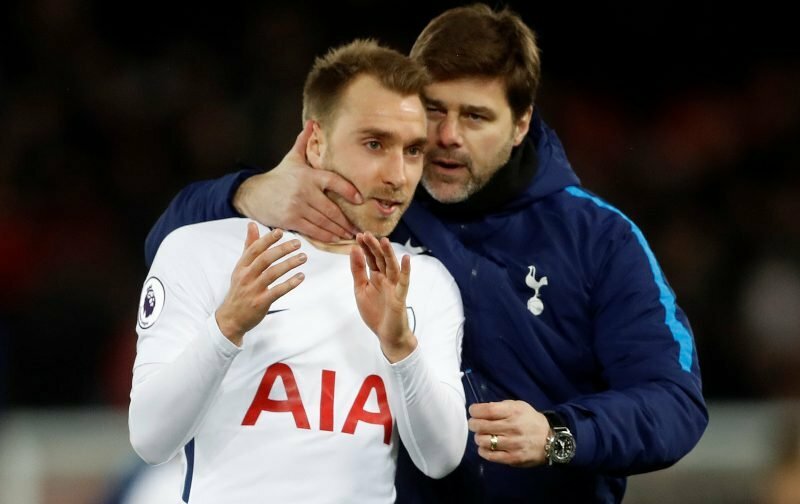 As the Evening Standard has already mentioned, the club are trying to tie down up to six players to new contracts, with Eriksen being close to the top of that list. Schoots is probably trying to stir things up by making interest in his client public. As we all know, Daniel Levy is a tough negotiator and whatever contract that has been put on the table to the Dane, it seems to be unacceptable to the player currently. Making it known that there are other teams looking to sign the playmaker is one of the oldest tricks in the book. Encouraging interest in order to secure a better salary for his client. I have no doubt that there are teams genuinely interested in recruiting Eriksen. After all, he had an excellent season, but even the teams he has been linked with such as Barcelona and Real Madrid, are not said to be going all in to sign him. Last week, Marca hinted at Real’s interest but stated that no bid would be forthcoming this summer. Barca are said to be keener but the two major sports newspapers in the city dispute how realistic a bid will be. Sport believe the club may consider him as an alternative for Antoine Griezmann but Mundo Deportivo say a move for the player would be impossible. With all that being said then, Schoots’s attempts to get a better deal for his midfielder are unlikely to get him anywhere with Levy. Such loose talk from agents always cause a stir among the fanbase, but I can’t see our great Dane moving any time soon. Hopefully, any speculation can be put to bed with a lengthy contract extension! A rare gem among the rubbish on the net. The problem football has is the inability of the powers that be to do anything to curb the power of agents. Most of them are jumped up Barrow Boys (apologies, they are not as good as barrow boys and a lot less honest). Agents should be registered and approved by the authorities; they should be paid exclusively by the player and not by both buying and selling clubs. But so long as the spirit of Sceptic Bladder lives on, then the administrators will continue to ruin the game and fleece the fans. These people are only equal in contempt with senior bankers; they have something else in common there! Given the universality and visibility of world football; no quality player is going to be ripped off by any major club for very long. If it’s happening, the competition are aware and will act accordingly. Young players playing for top clubs may benefit from having sound financial advisors who can ensure their funds are managed while they the players focus on their football. This career is short-lived at the top but very lucrative. The last thing any footballer needs is a parasitic agent. They detract from the players focus on his footballing skills and his loyalty by constantly suggesting the player is worth more and then they rip off 10 or 20 % of the wage for dishonest service. Agents are not needed to negotiate contracts. In fact, I suspect, many clubs are less generous when an agent is involved. If a player plays for an agent instead of the club; he is obviously less valuable. Players would be well advised to avoid these parasites. CE’s agent says they don’t want to say anything and so an article is born… about absolutely nothing! This is from the Independent newspaper, Feb 27th, 2018. ….. And the 26-year-old’s agent Martin Schoots has admitted that the offers have not stopped for Eriksen but that they must mean that his client is playing well. “Since Christian was 14 years old, big clubs have shown interest,” Schoots told Danish newspaper BT. “The first were Chelsea, AC Milan and Barcelona, since then there has been no transfer window without any offer or interest. “But when clubs like Real Madrid, Barcelona and Manchester United are mentioned, it’s always a compliment. “The only thing I can say is that concerning the interest of several clubs in Christian is that we prefer not to comment,” Schoots said. “Christian wants to focus completely on the World Cup – just as he did before on qualifying for the Champions League with Spurs. HT – thanks for clearing that up. Those quoted words make CE’s agent sound like one of the good guys, if there is such a thing in the world of football agents. The point remains though that if we don’t get CE signed to a new contract and we don’t start winning trophies then we should expect him to leave for pastures new. He is 26 now. Also worth noting that a generation of these types of playmakers are now retiring from the game or getting close to the end. Iniesta has moved to Japan not long after Xavi left the Nou Camp. Then you consider the ages of Modric at RM and Silva at City whilst most Arsenal fans have missed the talents of Cazorla for a couple of seasons. Eriksen can take the ball in tight spaces, retain possession and play the clever incisive balls that these types of players built their reputation on. This summer it seems that Pep is targeting Mahrez for more of that type of ability whilst Barca have already taken Coutinho and are still looking at Griezman. It’s a team like Real Madrid that I worry about most. Hopefully we can get Eriksen’s contract sorted now and if he does leave us in one or two years time it will be for massive money. Also be nice if Poch could nurture a natural successor whilst Eriksen’s still at the club. We look a shadow of the team when he’s not playing. Soonner or later players of exceptional talent want the salary and opportunity to win honours befitting their ability and status. Sooner or later this will apply to Eriksen and others such as Ali and Kane at Spurs. We can play Canute and hold back the tide for so long, but sooner or later the reckoning will come. So it seems, according to some, that in pro- football today its only the cash and trophies that matter, so a lot of pro-players are wasting their time then, maybe we should all give up worshipping certain players we have, because in the end if we do not pay the wedge they will be off, loyalty! what is that in today’s game. It is probably best to ignore the players and just support the club as a whole and not bother with who comes or goes because in the end the fat wedge is more important. Always difficult to interpret comments reported in a newspaper, given that the context usually isn’t clear. Did the agent initiate the comment, or was he asked some question by a reporter or someone to which he felt compelled to provide an answer? The words reported here could be interpreted quite differently depending upon the context in which they were made. This could be an aggressive move to start something by an agent or an attempt to dampen down speculation. No reason here to get perturbed by this. We’ll see in a bit if there’s something to cause alarm. As of now, I don’t see any clear story developing from these words. Eriksen is at his peak. He has finally put some consistency together. He is ready to play for any of the bigger clubs. If he stays then that would be great news. I’m surprised we have kept him for so long. I hope we can get at least one more season out of him. We can’t expect to keep him here without paying him the big wads and winning trophies. Same goes for Alli, Kane, Hugo. I’m sure they are happy here. But like it or not most players like winning trophies and doubling their wages. I don’t know what any of the VS fraternity do for a living, but I would guess that if they were able to double, or in some cases treble their income, and again for some to live and work in luxury in countries with a wonderful climate, they would turn it down due to a perceived loyalty to their current employer. I think not. Anyway, not that many of us on an average income will to get double or triple our pay packet by shifting companies but doing the same job, as with a top pro footballer. But, I actually did manage to shift from one very similar job to another, where the difference in my income was about a 3rd between the two jobs. I chose to pursue the one that paid me less but was much less stressful, gave me more time for myself and with bosses that appreciated me much more. In other words one was nothing but pressure, too much travel and too many hours working for people I didn’t like. The other one simply made me a happier and far more sociable person that could enjoy my life and free time. As opposed to Work, work, work. Sleep, sleep, sleep… Ah, but I could only then afford the one bicycle as opposed to having 3 of them! If I were a pro footballer, I’d be the same and if I had the choice, I don’t think that the money would be the deciding factor in where I might play my football. Tottenham for a hundred grand a week or wherever for 200 grand a week? I don’t know for sure if I’m to be honest. But what I do know is that one stately mansion, one Bentley and one girlfriend or wife would be more than enough for me to go home to, knackered, at the end of my working day, wherever it may be. And I do believe that even the lower wage of £100,000 a week, would do it. Unless I feel the unrelenting need for 2 or 3 of everything and I know I’ll be much happier in Madrid than somewhere near North London. It’s not even necessarily about loyalty or the lack of it. If you are greedy, loyalty will probably, eventually take a back seat. But, if say Eriksen is a happy man at Spurs, then maybe his happiness is far more important to him than the extra money or even some shiny new winners medals. Who knows? And, let’s face it the money at Spurs is still far greater than at MK Dons… It’s all relative, I would think. If Spurs were to offer to double Eriksens wage tomorrow but Barca are desperate for him to go there, offer him 3 times as much and he and his family want to up sticks and move, with their 1st born on the way. What say Levy? I’ll match their offer Christian and I’ll also throw in some of the finest tapas and Crema Catalana money can buy, build you a luxury villa with pool and a virtual view of the Sagrada Familia. But, if it’s the Catalonia sunshine and Saturday nights out with Messi you’re after, I no can do! Deal, or no deal? Que? We as fans are not party to all the contract details clubs and players lawyers (agent too) input. But I do know from a very reliable ITK i have known 15years or so… Spurs pay the best bonus package of PL clubs. So an average £60 – 75k weekly salary can be substantially more… based upon performance of the player & team mates. With THFC doing well in leagues etc. Ericcson lives in close proximity to Daniel Levy & Jan. The players have houses built on land Levy had around his own house not far from Training Ground Enfield. I do know where but cannot say in respect of Mr Levy’s and players privacy. So as Ericcson has said he is settled in at Spurs, and 1st child on the way, so he is happy at spurs, we can have some comfort in that he will not leave anytime soon.